The Quechua name Qenqo means labyrinth. In the worldview of the Andean culture, this place was built to invoke to Kaypacha, legendary snake that gives rise to life. The Incas used this place as a bridge to communicate with others of their gods like the sun, the earth, the mountains, the moon and the stars. Everything in this place has a special mystique, the amphitheater, the mazes, the canals and the sacrificial room. Although the true name of this shrine is unknown, in the time of the conquest the Spaniards decided to name it Qenqo , a labyrinth in Quechua, perhaps by the labyrinthine underground galleries, or by the zigzagged channels carved into the rock. The Spaniards classified this enclosure as an amphitheater, apparently by the semicircular construction that is there. Nevertheless, the true function of this cyclopean construction is ignored, since it could well be a ceremonial center, a court or a royal tomb, perhaps of Pachacútec. According to the scholars, it is possible that it was one of the most important sanctuaries of the Inca civilization, whose nature has not yet been deciphered; In the enclosure it emphasizes the predilection that had the Incas by the carved stone very carefully. To 4 km of the square of arms of the Cusco, about the 3,580 msnm You can arrive in 5 minutes by a asphalted road to the northeast of the city of Cusco. 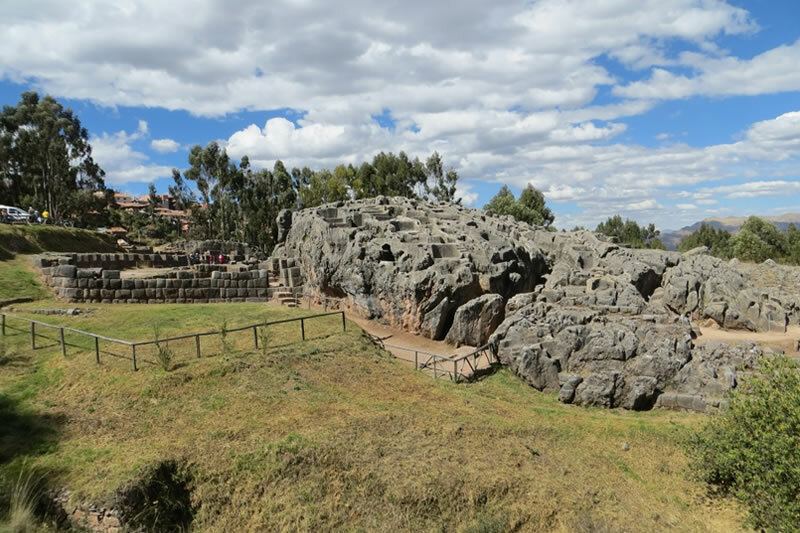 There are two places: Qenqo Grande located at the foot of the path that goes from Sacsayhuamán to Pisac; And Qenqo Chico , which is located on the slope 350 meters west of the former. This site is located on the current Socorro hill and has an area that exceeds 3,500 square meters. It is a temple used during the time of the Incas to celebrate public ceremonies, is a semicircular enclosure of 55 m. Of length, with 19 unfinished niches along the wall, some publications claim that the niches were arranged as seats for the entities they worshiped. However recent research says that it is possible that they were the bases of a great wall. Passing the free area you will see a large block of stone 6 m high, which rests on a rectangular pedestal. Possibly a huge zoomorphic sculpture. The imprecision is due to the destruction caused by the extirpadores of idolatries (personal that were in charge to eliminate icons of local cult) during the colony. It has a rocky bump with a wrought passage, leading to an underground room, rooms, a set of platforms, and a drainage system intended to evacuate the water from the place. At the back of the stone rises a small rocky formation in which you can find a staircase, carved in the living rock, which leads to the summit. It is this place from a smaller hole is born a small zigzag channel that descends to then bifurcate in a two branches, one that follows the slope and another that descends to the subterranean chamber. Perhaps it was poured into chicha or blood of flames, offered in rituals not yet clarified. At the summit are remaining figures of what could have been a condor, whose head was removed; As well as that of a puma. You can also see the remains of a room. On a polished rock stand out two small cylinders. It is probably an Intihuatana , translated – ” place where the sun is tied “, this allowed to calculate the position of the sun. Its functioning remains an enigma until today. It was supposed to be a kind of astronomical observatory, which was used to measure the time and changes of season, to determine solstices and equinoxes, and as a place of worship to the principal deities, the Sun, the Moon, the earth and the Stars. Quechua name meaning ” temple or place that has monkeys “. Located 500 meters east of Qenqo Grande. It houses a carved stone of almost 2 m. Of height, whose form resembles that of a toad. On this rock, there are still some engravings of snakes and monkeys, possibly related to the name of the place. The lithic work done in this place was undoubtedly a feat. The floors, walls, tables and niches were carved very carefully into the living rock. It was certainly a place where secret ceremonies were held. It has service rooms in the vicinity. It also has a drainage system for rainwater. It is located very close to the Intihuatana. The student of the Inca culture Victor Angles describes it as: “part of a small hole, moves in inclined plane and broken line, then forks, one of the branches led the liquid put to circulate until the Underground Chamber or Room of the Sacrifices. “The liquid that sprang up could be the blood of sacrifices (animals and / or humans) to the gods. The mystery that the ceremonies of the Andean cult keep, is one of the attractions of the Inca Culture. The doubts of the denominated ” Room of the Sacrifices ” still have not been solved. It is an underground chamber carved completely into a gigantic rock. In the lower part of the rock structure are carved, the floor, walls, ceiling, tables and cupboards. It is known that this chamber may have been used to embalm orejones, but human and animal sacrifices could also be carried out on site. Qenqo Chico, this place is found rather more destroyed than Qenqo Grande; Shows remnants of high walls, circular planning and the same care in working with the rock.